The most annoying thing is, the Internet stopped working when you’re doing important work. Recently a few days back I faced the same issue and got an error DNS_PROBE_FINISHED_NO_INTERNET. But there is no working solution was available on the internet, and it’s really frustrating. But every problem comes with a solution, all you need to do is find out. So After doing so many research, Finally I got a working solution to fix DNS PROBE FINISHED NO INTERNET. There are many causes behind this error, So there is not any single fix available. So In this article, I added all method to Fix this error. And I hope after following all the steps your Internet will start working and if not then you can comment. 1 Solution: 1 Check your Modem Lights and Cables. 2 Solution: 2 Using Command Prompt. 3 Solution: 3 Replace your DNS with Google Public DNS. 4 Solution: 4 Update Network Driver. 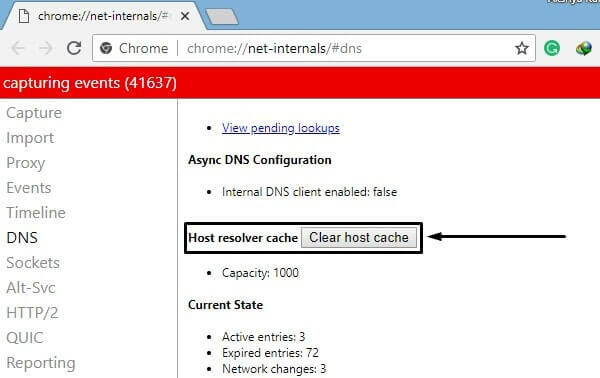 5 Solution: 5 Clear, Host Cache in Chrome. 6 Solution: 6 Clear Browser Cache, Uninstall Extensions, and Reinstall Browser. 7 Solution: 7 Restart DNS Client Service. 8 Solution: 8 Reset Network Settings. 9 Conclusion: Fix DNS PROBE FINISHED NO INTERNET. Solution: 1 Check your Modem Lights and Cables. Are you using a Wireless or Wired Modem? Then you need to check few things to Fix DNS PROBE FINISHED NO INTERNET. Check LED in Modem – There are mainly two lights that you should check whenever you face this error. DSL light should always stable, If it’s not the issue is with your Internet line contact your Internet service provider. 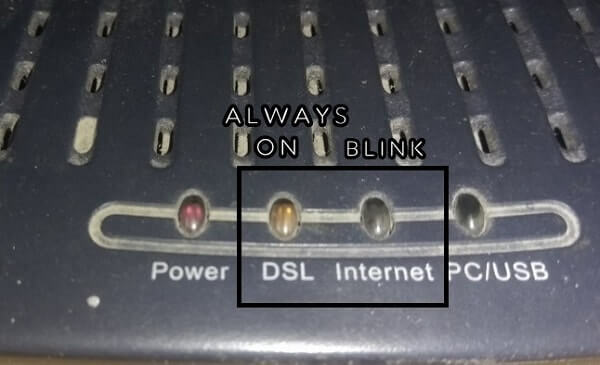 If DSL light is stable and Internet light isn’t blinking then move to the next fix. Note: Blinking Internet LED lights Indicates that the Internet is working fine, Problem is with your Device DNS. Check Cable – Sometimes due to loose internet cables this issue occurs, So check cables from all ends. And if your Modem is connected with landline connection then check it’s working or not. Sometimes picking up landline phones fix the issue, If same thing happening with you then use 6 wired line. Final Fix – Switch Off your modem directly from power outlet wait for at least a min, Before restarting it again. Solution: 2 Using Command Prompt. As I said before, If there is no hardware (Modem and Cables) issue then maybe DNS is the cause. So to fix “DNS PROBE FINISHED NO INTERNET” you need to flush DNS. 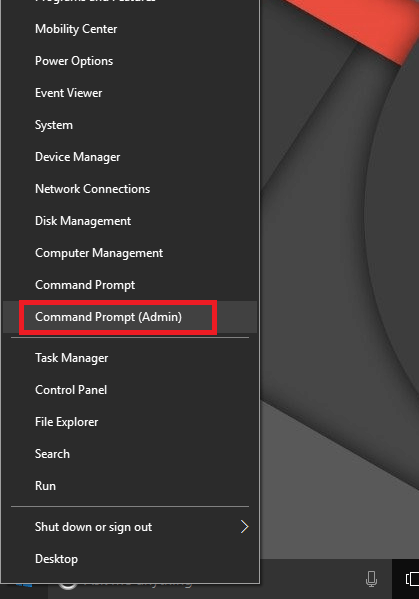 Step: 1 Open CMD (Admin) – In Windows 10 Right Click on Windows Icon and Select “Command Prompt (Admin)” Alternatively If you’re using any other version of windows then press WIN + R, Type CMD and press Enter. Now check your internet, hopefully, it will start working again. If not then you need to flush DNS to fix this Error. But before flushing DNS you need to release and renew the IP, so type the following command one by one and press Enter. Type ipconfig/release and press Enter. Type ipconfig/renew and press Enter. To Flush DNS type this command ipconfig/flushdns and hit enter. After giving all the command and getting the successfully flushed message “Restart your computer”. Solution: 3 Replace your DNS with Google Public DNS. 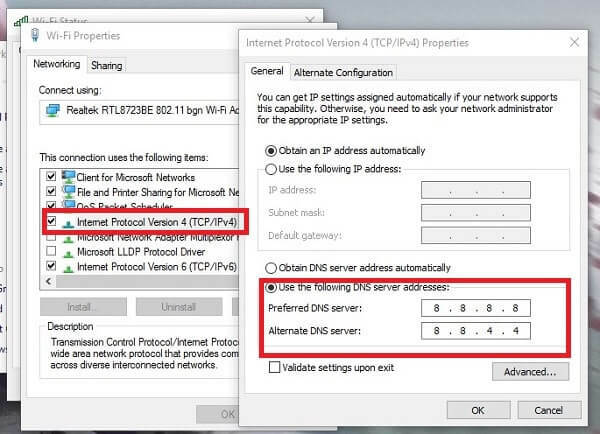 If you’re facing DNS PROBE FINISHED NO INTERNET error only in your computer, And the Internet is working in other devices then follow this method. To fix this issue you need to replace your default DNS IP address with Google Public DNS. Step: 1 Right-click on your Internet icon (Wifi Icon) and choose “Open Network and Sharing center”. Alternatively, you can go to Control Panel > Network and the Internet > Network and Sharing Center. 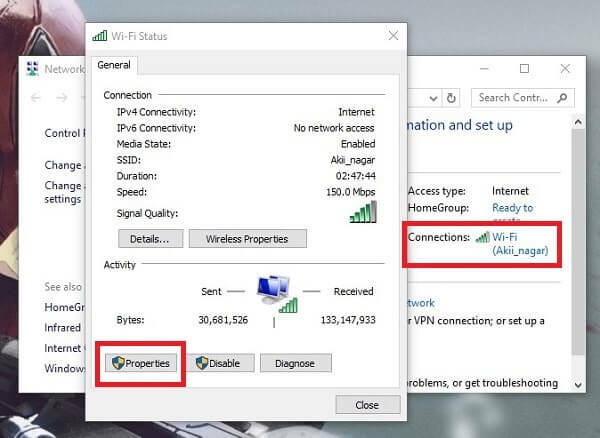 Step: 2 Click on your network name / Connected WiFi, now a Window will appear to click on properties. Step: 3 When network/WiFi properties window appears select TCP/IPV4 and then click on properties. On IPV4 properties window select to use the following DNS address and type the following DNS and select OK for all window. Use the same method for IPV6 and replace it with the following Google DNS Address. After changing DNS address, Restart your modem once and your internet will start working again. Solution: 4 Update Network Driver. Step: 1 Right Click on My Computer> Manager, Computer Management window will appear. 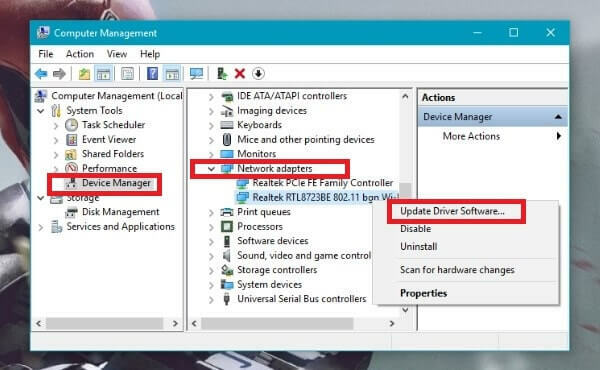 Click on Device Manager then expand Network Adapters, It will show you Installed Drivers for the internet. Note: If there is the yellow mark on any driver then it means the drive is outdated, To update the driver you need an internet connection. Alternatively, you can download the driver on your mobile device and then move it to the computer. 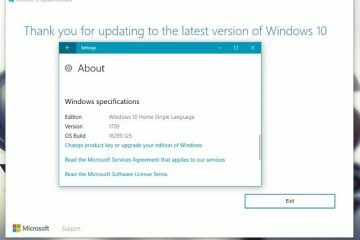 Step: 2 To update driver, Right click on it and then choose Update Driver Software. A window will appear to choose “search automatically for updated driver software”. If you have the latest network then choose to Browse My Computer for driver software and select the downloaded driver. If you’re unable to find out the required driver for your network / WiFi then you can try third-party driver updater software. And the best software to update outdated drive is “Uniblue DriverScanner”. Solution: 5 Clear, Host Cache in Chrome. Chrome Browser comes with its own net internal settings. And, if you had messed up with it, because of some unwanted changes. Then, this error occurs. Though, you can fix it by clearing host cache. This solution works with other DNS related issues. But, still, it’s worth trying with this error. And, this solution is only for Chrome Browser. 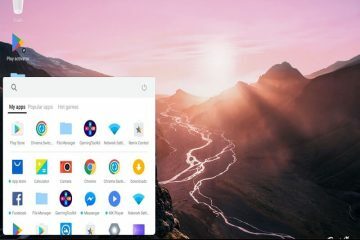 And, it won’t work in any other browser like Mozilla Firefox or Microsoft edge. Open the following link in the Chrome browser. You will able to see a couple of options. Don’t make any changes in those options. Just click on “Clear host cache” button once. And, it will clear the cache immediately. Solution: 6 Clear Browser Cache, Uninstall Extensions, and Reinstall Browser. 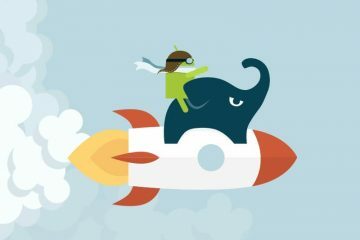 If the Internet is working flawlessly in Incognito Browsing Mode then the problem with your cache or maybe with Extensions. And if problem not gets solved the uninstall browser and perform a registry cleaner and then install the latest browser. Clean Cache – To clear cache in any Browser press Ctrl + H to open history page in Chrome Browser. 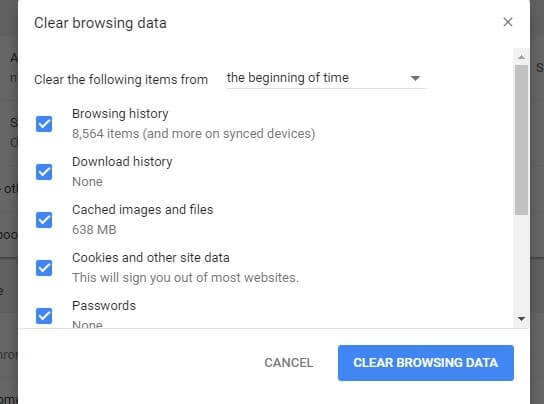 Choose “clear browsing data” option, a window will appear to choose “the beginning of time” option from drop-down menu. And at the end select Clear browsing data, it will take a few minutes. When the process gets complete restart your browser, type Chrome://restart in the URL bar and press Enter. Solution: 7 Restart DNS Client Service. 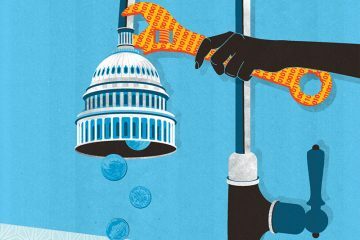 It could possible that DNS Service has stopped working. In that case, “DNS_PROBE_FINISHED_NO_INTERNET” error occurs. It’s a local Windows Service, that caches Domain Name System Names and Registers your full Computer Name. If DNS Client service is stopped due to some reasons. Then, other services that depend on it will fail to start. So, make sure it’s working perfectly. Note: You can also access services window using Task Manager. But, this is the fastest way to access. 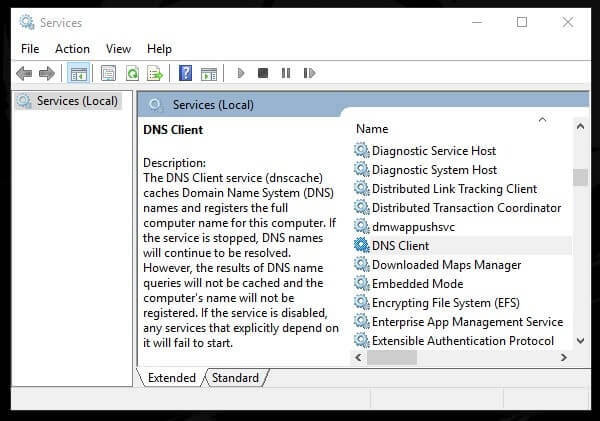 In Services Window, look for “DNS Client” Service. Right Click on it and then hit the restart option. If “stop, start and restart” options are disabled. Means, you need to add a working DNS Server in IPv4 and IPv6 Settings. Or, maybe the problem is with the service provider. Solution: 8 Reset Network Settings. Although, this solution will reset all changes done by you. And, will set your all network settings to default. This option also will remove Google Open DNS Details. So, if any of the above solutions don’t work. And, “DNS Probe Finished No Internet” error still coming. Then, you can try this solution also. Click on Network & Internet Section. On Network & Internet Settings Page, Scroll down and look for “Network Reset” option. 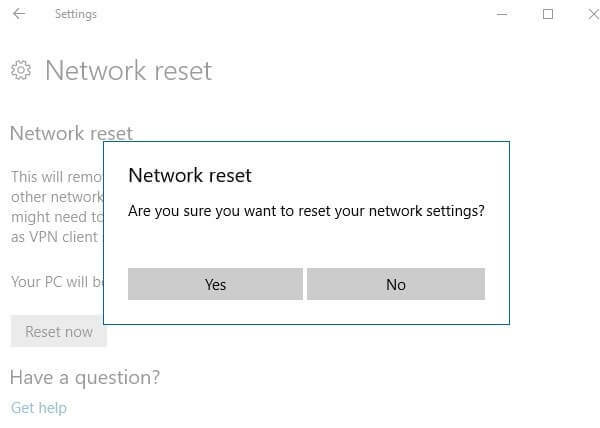 Open Network Reset Settings now, Click on “Reset Now” to reset connected network. This option is available only in Windows 10. And, this option will also remove connected WiFi Password. So, you need to enter the WiFi security key again. Conclusion: Fix DNS PROBE FINISHED NO INTERNET. So these are the solution available to fix this Error if still, you’re facing the same issue then. Check which software of network monitoring program you installed recently. 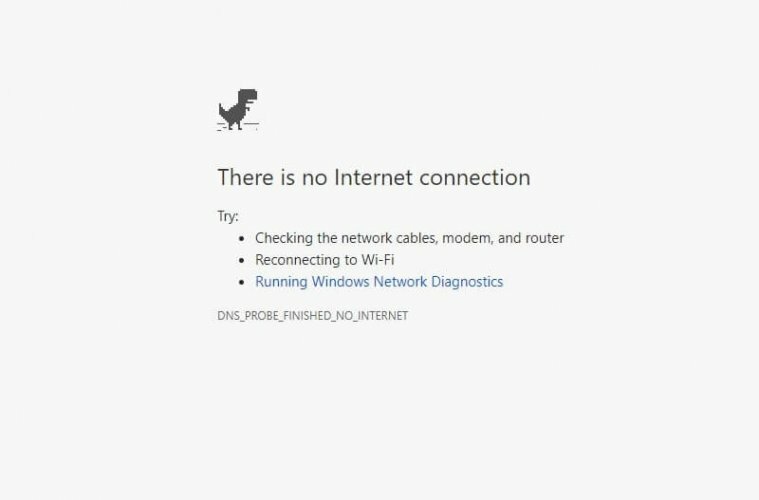 Else contact your Internet service provider only then can fix this issue. That’s all folks If you got any better solution feel free to comment. Previous ArticleBest GBA Emulator for Android, Windows, Mac and Linux. 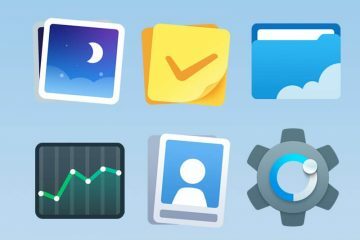 Next ArticleHow to Block text messages on Android – Working Method.